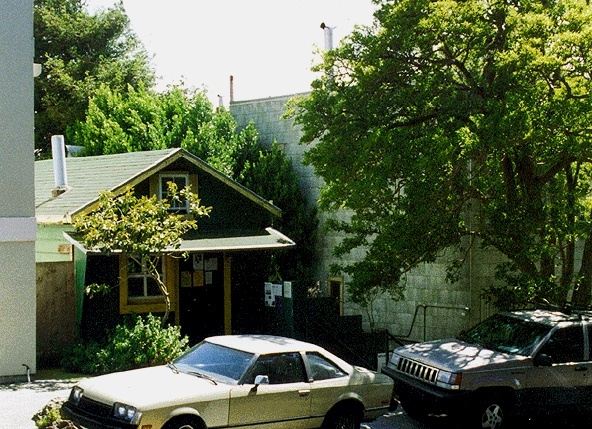 Bill Bailey's cabin, mid-1990s. It was later removed to make way for new condominiums, and after sitting at Islais Creek near the Copra Crane for some months, it was burned in an arson attack. It has not yet been restored (2008). 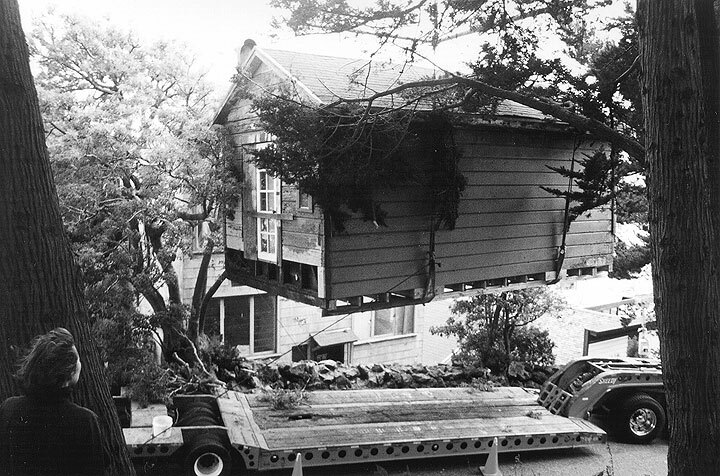 Bill Bailey cabin being removed in 1999, on its way to a sorry end next to Islais Creek. Bill Bailey grew up in poverty in the decaying tenements of Hoboken and Hell's Kitchen. Leaving school in the 5th grade to look for work, he rode the rails and hoboed around the country, finally landing on a ship in 1929. There he met members of the Wobblies who were the first to introduce him to radical politics, and to the hope of a decent life for working people. From then on, Bill's commitment to fundamental social change, to a world where needs of people come before profits, was unwavering and forever. He joined the Communist Party during the depression, finding its members the hardest-working, most effective fighters against injustice, discrimination, bitter working conditions. He organized workers in maritime from New York to California and Hawaii. 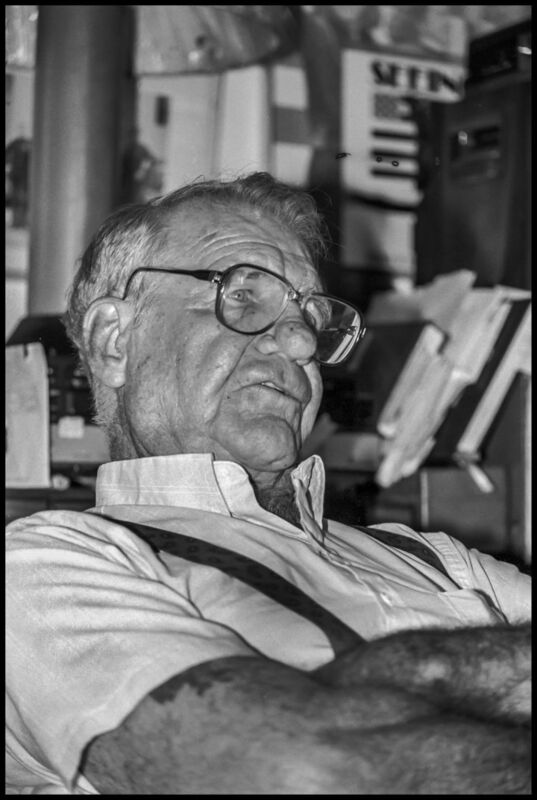 He was screened from the waterfront during McCarthy's reign, kicked out of the Marine Firemen's Union (reinstated with honor in 1989), faced years of little work as the FBI visited successive employers, and finally found a home in the ILWU in 1953. Bill gained early notoriety in 1935 when he and a group of seamen boarded the German ship Bremen in New York harbor and tore the Nazi flag from the mast before 5,000 wildly cheering demonstrators on the dock. Soon after, he again acted as a "premature anti-fascist" by fighting with the Lincoln Brigade for the elected government of the Spanish people. Bill left the Communist Party when the Soviet Union invaded Hungary, but he continued to be wonderfully fruitful in his later years. His great ability to tell stories and bring alive the drama of this century resulted in his appearances in documentaries "The Good Fight," and "Seeing Red," as well as in Hollywood movies with progressive messages. He was interviewed for countless TV, radio shows, and publications. He led tours of waterfront battlegrounds and was invited to speak to many high school, college classes, and other groups where he encouraged people to remember workers' struggles and commit themselves to continuing the fight for a more humane world. In 1993 his autobiography The Kid from Hoboken was published and he was working on a sea story when he died on February 27, 1995. --from a poster attached to the cabin's door before its removal in June 1999. 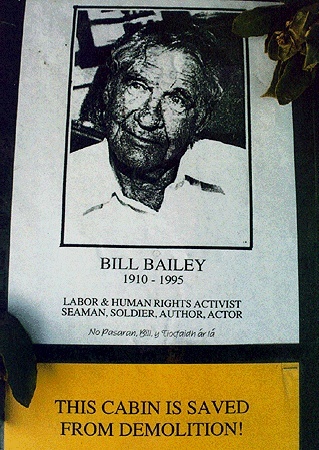 Sign on Bill Bailey's cabin. 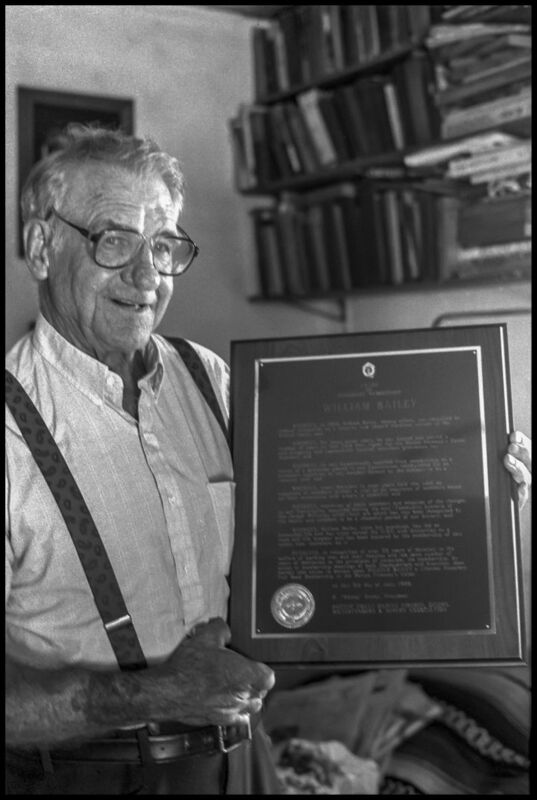 Bill Bailey with his plaque reinstating him to full membership in the Marines Fireman's Union, after he had been expelled in the 1950s for being a Communist.